White Wolf : Two Silly Fox Kits Stumbled Upon a Backyard Trampoline, and Had a Blast! Two Silly Fox Kits Stumbled Upon a Backyard Trampoline, and Had a Blast! Every kid loves a good trampoline, but now that rule applies to every kit. Two red foxes wanted to experience the joys of trampoline time so badly, they snuck into a backyard to have some fun. It’s easy to see who the trouble-maker of this pair is. As one of the foxes happily jumps and explores the trampoline, the other cautiously observes from the edge. The adventurous little fox can be seen displaying some typical fox behaviors on the trampoline, including jumping like he is looking for prey, while his unsure partner in crime continues to keep watch of the perimeter. As the video progresses though, we see our nervous little friend start to come out of his shell and even scare his buddy right off the trampoline’s edge! It has been said that play is one of the greatest signs of intelligence, so these foxes must be super smart. Wildlife coming into contact with humans is becoming more frequent as we inhabit much of their natural terrain. Remember to keep your distance and to take a video. Chances are they are there for their shot at YouTube stardom! 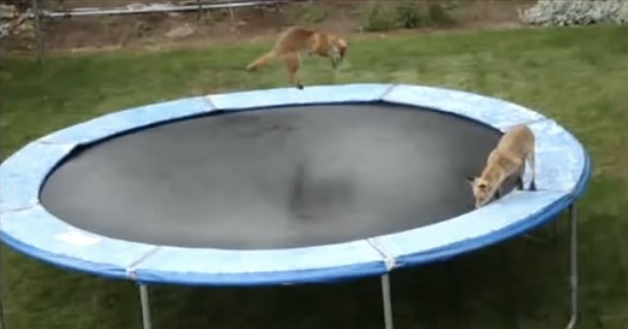 Responses to "Two Silly Fox Kits Stumbled Upon a Backyard Trampoline, and Had a Blast!"